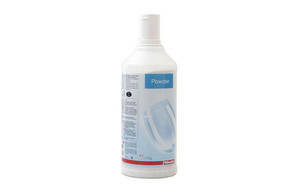 Bottom line: This powder dishwasher detergent performs well overall and costs 36¢ per wash. It's very good at removing egg-yolk and minced-meat stains, good at removing baked-on cheese, red wine and coffee stains, and OK at removing rice stains. OK at removing rice stains. Good at removing baked-on cheese stains. Good at removing red wine stains. Good at removing coffee stains. Confirmed as phosphate free by the manufacturer. Available online at miele.co.nz.